"Whenever the goalie is behind the net, you just try and get open, just in case," Wilson said. "(Kuznetsov) makes a great play, and you've just got to try and get it there before the goalie gets back in the net. It was good timing." "(Holtby) was a big reason we were able to get two points tonight," Washington coach Todd Reirden said. "He was outstanding all game long. He had a huge role in us winning that game." "I thought I could get there," Holtby said. "I was thinking I'd kind of have to get down to try and seal the ice and get it out of the blue line there. I didn't really see the second guy coming so after that you just try and do whatever you can to keep it up." 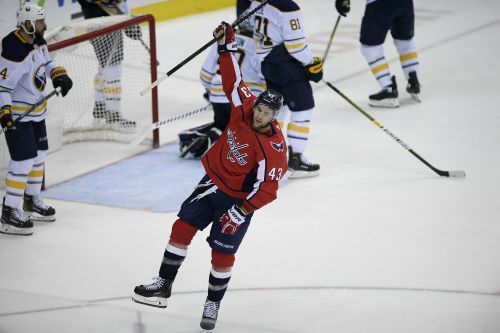 The Sabres then went on a power play 2:37 into the period, but Washington scored 13 seconds later with its second short-handed goal of the season. Dowd flipped a puck in the air from the Capitals' zone that sprung Chandler Stephenson on a breakaway, and he beat Hutton for his first career short-handed score. "Holtby played terrific," Housley said. "Give Holtby credit. He's a pretty good goaltender, and there's a reason why he won the Stanley Cup." NOTES: Andre Burakovsky returned to the Washington lineup after missing the past four games as a healthy scratch but did not score a point. ... Housley played two seasons for Washington. ... Jack Eichel and Jeff Skinner of Buffalo had seven-game points streaks end.